Benchmark is a powerful email marketing solution that enables you: to send automated email series triggered by website and email engagement; to customized the look, feel, and feature sets of your email; to, build loyal fanbase that engages with your message via list builders, surveys and polls, along with comprehensive tracking, reports and mobile apps and third-party integrations. Benchmark not only gives you the capability to integrate with more than 300-plus applications including Google, Salesforce, PayPal, but it also comes with a WordPress plugin that allows you to build an email list right on your WordPress site, send formatted email versions of your blog posts and integrate your site with up to five separate Benchmark email accounts. Pick a trigger: when a customer subscribes, they are added to a list. This is your automation trigger. Send a welcome email: schedule an email to be sent out as soon as they subscribe. Welcome subscriber: automate your welcome email series and onboard subscribers with ease. Convert leads: Use the app’s template to turn subscribers into customers. Purchase confirmation: automatically move subscribers from your leads list to your customers list. Responsive emails: allows you to design emails dressed to impress. Whether your email is being read on a desktop, tablet or smartphone, your email will always look its best. Since each organization has specific business needs, it is prudent for them to refrain from seeking a one-size-fits-all faultless software application. Needless to say, it would be useless to try to find such a system even among market-leading software solutions. The clever thing to do would be to jot down the various important elements that need consideration such as required features, budget, skill levels of workers, company size etc. Then, you should do your homework thoroughly. Read some Benchmark reviews and investigate each of the other systems in your shortlist in detail. Such exhaustive research can make sure you weed out ill-fitting systems and zero in on the solution that offers all the aspects you need for business success. How Much Does Benchmark Cost? 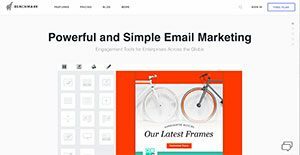 Send email campaigns to up to 2,000 of your subscribers for $0 per month. Also includes: 2,000 subscribers, 14,000 emails per month. This plan allows for 1,000 subscribers, unlimited sends per month. We realize that when you make a decision to buy Email Marketing Software it’s important not only to see how experts evaluate it in their reviews, but also to find out if the real people and companies that buy it are actually satisfied with the product. That’s why we’ve created our behavior-based Customer Satisfaction Algorithm™ that gathers customer reviews, comments and Benchmark reviews across a wide range of social media sites. The data is then presented in an easy to digest form showing how many people had positive and negative experience with Benchmark. With that information at hand you should be equipped to make an informed buying decision that you won’t regret. What are Benchmark pricing details? What integrations are available for Benchmark? If you need more information about Benchmark or you simply have a question let us know what you need and we’ll forward your request directly to the vendor.